Built in 2005, by the Foss Maritime Shipyard of Rainier, Oregon (hull #4) as the Campbell Foss for the Foss Maritime Company of Seattle, Washington. She was the second Dolphin class tractor tug designed by Robert Allan Limited of Vancouver, British Columbia. For the Foss Maritime Company of Seattle, Washington. She was powered by two, series II, Catepillar 3512B HD diesel engines. With Rolls Royce US 205 FP z-drives. For a rated 5,080 horspower. Her electrical service was provided by two, 125kW Marathon generator sets. Driven by two, John Deere 6081 diesel engines. The tug's capacities were 10,000 gallons of fuel oil, 342 gallons of lube oil and 500 gallons of fresh water. In 2011, after reciveving one million dollar grant from the California Air Resources Board. Under the AB 118 Air Quality Improvement Program. The ports of Long Beach, California, and Los Angeles, California partnered with the Foss Martime Company in an effort to reduce carbon emissions in the respective ports. The Campbell Foss was the second Hybrid tug placed in service for Foss Maritime Company. However, she was first tug be converted to a hybrid tug. 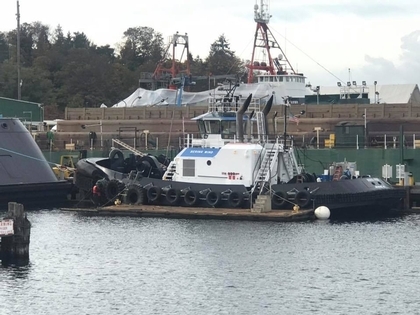 The Foss Maritime Company partnered with Aspin Kemp and Associates to retrofit the tug with the hybrid technology. She was retrofitted with motor generators, batteries, and control systems at the Foss Maritime Shipyard in Rainier, Oregon. Powered by two, series II, Caterpillar 3512C HD diesel engines. With Rolls Royce US 205 FP z drives. She is rated at 5,080 horsepower. Her electrical service is provided by one, 125kW Marathon generator set. Driven by a John Deere 6081 diesel engine. One, 350 kW, series 60, Tier II compliant, MTU generator set. With two, 500kW Teco-Westinghouse generator sets. Tied into a bank of Corvis, lithium, polymer batteries. The tug's capacities are 10,000 gallons of fuel oil, 342 gallons of lube oil and 500 gallons of fresh water. The tug is fitted with a computerized energy management system, or EMS. The EMS is designed to reduce all possible combinations of power into four power bands. And, automatically configure power sources to the propulsion, and hotel loads required according to demand. These power bands are given user-friendly labels such as "Minimal Emissions," "Eco-Cruise," "Mid Range," and "Full Power." The operator may choose whatever level is appropriate: "stop," "idle," "transit," or "assist." All are arranged on a small panel in front of the operator. Then as the operator makes demands on the z drives, via the joystick, and winch controls. The system engages the required power plant combinations. The bands are designed to automatically conserve the most fuel, and emit the least emissions for each mode of power required. Stop mode is when the vessel is idling between assignments. And, or is using less than five percent of her propulsion power, and the power configuration is typically for one, or two auxiliary generators running. And, stored energy available for use. Transit mode is for continuous, and slow transits. As well as, low power work using less than twenty two percent loads for extended periods. A typical plant configuration is one main engine, and two auxiliary generators running. One main engine on one driveline, and a powered MG on the opposite side to provide propulsion. The system permits both ASD's to be operated by one main engine. Battery power can be used as a temporary ride through of transient demands. Assist mode is during continuous, fast transit, and a large percentage of ship assist work. Where maximum power requirements do not exceed forty six percent for extended periods. The typical configuration is two main engines. If the batteries need recharging in this mode, one or both auxiliary generators will engage. Full Power is for continuous fast transit, and full power ship assist work. A typical configuration is two main engines, plus two auxiliary generators, with battery stored energy available to reach full power, and most transient demands. The plant is also capable of providing full shaft horsepower for propulsion. 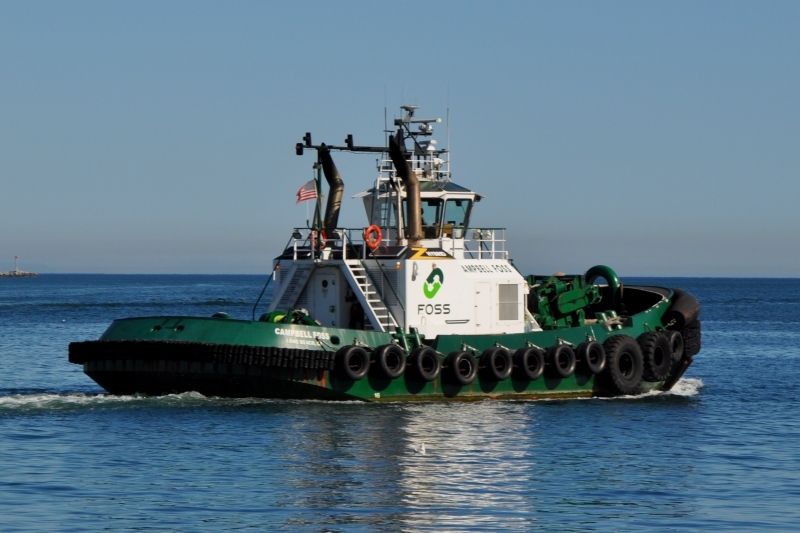 In 2018, the tug was transferred to the Foss Marine Holdings subsidiary. The Cook Inlet Tug and Barge Company of Anchorage, Alaska. Where the she was renamed as the Bering Wind. Her towing gear consists of a Markey DEPGF 42 winch on her bow. The tug's power system can accept regenerated power from the winch. The DEPGF 42 hybrid winch, is configured to generate power back into the batteries when the winch is rendering, the motor acts as a generator.